Last year, the number of hungry people in the world increased for the first time in more than a decade to 815 million, up from 777 million in 2015 (see ref 1). The UN’s report on the State of Food Security and Nutrition in the World issued a stark warning that this could be the start of a reversal of the year-on-year decreases in hunger that had been seen prior to this. So what could have caused this increase? Well, the report attributes this to conflict and climate change. 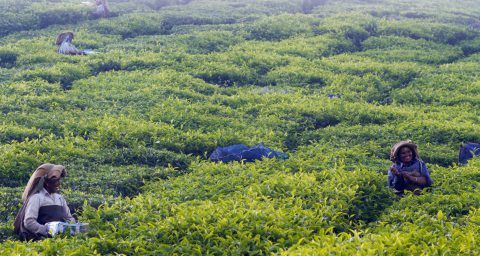 The relationship between food security, conflict and climate change is complex. Food insecurity can have a role in catalysing conflicts, while at the same time conflicts can exacerbate food crises, resulting in a vicious circle that is difficult to break. In addition, post-conflict countries with high food insecurity are 40% more likely to relapse into conflict within a 10 year timeframe, demonstrating the need to rebuild food systems as quickly as possible (see ref 2). In Syria, religious differences, a failure of the ruling regime to tackle unemployment and social injustice, and the state of human rights all contributed to a backdrop of social unrest. However, these pressures were already in existence. An intense drought between 2007 and 2010, alongside poor water management, saw agricultural production collapse and mass migration from rural areas to city centres. Farmers, who had been relatively wealthy in their rural surroundings now found themselves as the urban poor reliant on food imports. Between 2007 and 2009, Syria increased its annual imports of wheat and rice flour by about 1.5m tonnes. That equated to a more than ten-fold increase in importing one of the most basic foods (see ref 3). This drought, combined with a global shock in food prices and existing tensions fuelled social unrest and the conflict that ensued in Syria. Whilst there were many causes, the availability of water and its impact on food production was clearly one of them. There is also some evidence linking human influences on the climate system to the drought, which was one of the most severe on record (see ref 4). 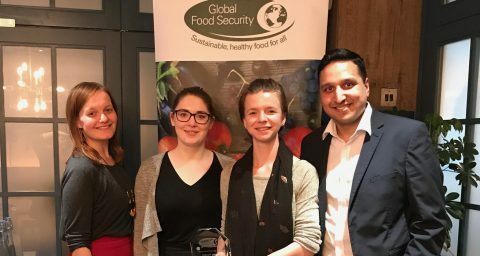 The GFS programme has led two major projects on climate-related risks to the food system, which have the potential for social unrest and political instability. One report looks at the rising frequency and severity of extreme weather and concluded that the risk of extreme weather hitting several major food producing regions of the world at the same time could triple by 2040 (see ref 5). Rather than average climate change, it is the variability that makes up the average temperature and rainfall that will produce the short sharp shocks such as heat-waves, cold snaps, droughts and floods. The other report looks at tipping points in food systems which result in longer lasting and potentially more permanent shocks (see ref 6). Tipping points exist in both biophysical and socio-economic systems. Small shocks may have little impact but, a particular shock or set of shocks could tip a system into a new but stable state. 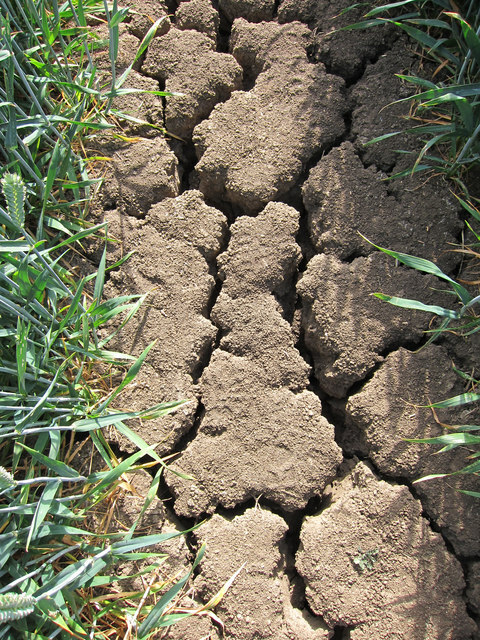 An example is the dustbowl in the United States, where the soil is no longer usable for agriculture following intensive farming and successive years of drought. The report features a set of case studies describing how climate-related tipping points could impact different parts of the food system. In both reports climatic shocks lead to a significant yield loss, leading to food price spikes and social unrest. There is some evidence linking food price volatility, social unrest and political instability as shown in the graph below (see also ref 7). The dependence on FAO Food Price Index from January 2004 to May 2011. 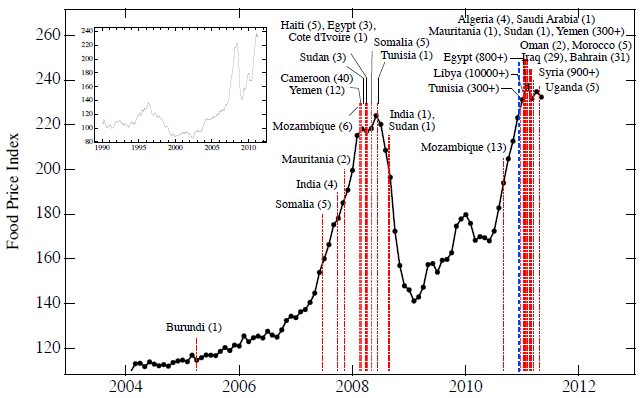 Red dashed vertical lines correspond to beginning dates of “food riots” and protests associated with the major recent unrest in North Africa and the Middle East. Blue vertical line indicates the date, December 13, 2010, on which the New England Complex Systems Institute submitted a report to the US government, warning of the link between food prices, social unrest and political instability. Inset shows FAO Food Price Index from 1990 to 2011. To manage these types of risks in future we need more interdisciplinary food systems research. This could focus on mitigating climate change risks to the food system whilst simultaneously developing ways to adapt. better coordinating global market and policy responses to production shocks. If we are to beat world hunger, a strong understanding of the dynamics across climate change, food security and conflict is required, and this has to be high on the research agenda. Food wastage at all levels is going to play a big role as well. Those who are currently “Food Secure” aren’t giving due importance to the stuff in hand.